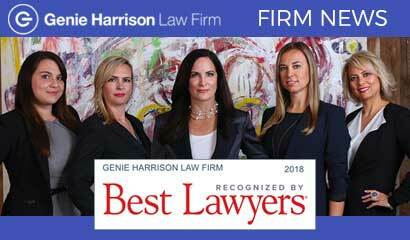 Employment lawyer Genie Harrison is widely recognized as a fierce advocate for victims of all forms of sexual assault, sexual abuse, sexual harassment, discrimination, and retaliation. Genie represents victims because she believes that you deserve justice. The results Genie Harrison has obtained speak for themselves – both in terms of compensation obtained for her clients and in terms of the systemic change she has created to better the lives of thousands who will never know her name, but whose lives are better as a result of her work. Genie has been acknowledged with rare distinction: she has been named to the Southern California Super Lawyers List in Plaintiff’s Employment litigation for eleven years in a row (2009-2019), for which only 5% of all attorneys in the state qualify in any single year. For four years in a row, 2016-2019, Genie Harrison has been listed on the list of Top 10 Super Lawyers in Southern California. 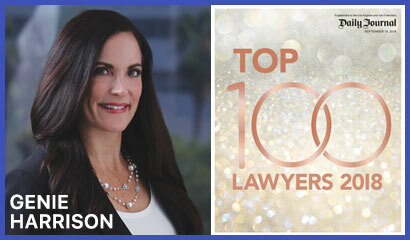 In 2018, Genie Harrison was recognized by the Daily Journal as one of the Top 100 Lawyers in California — across all categories of law. 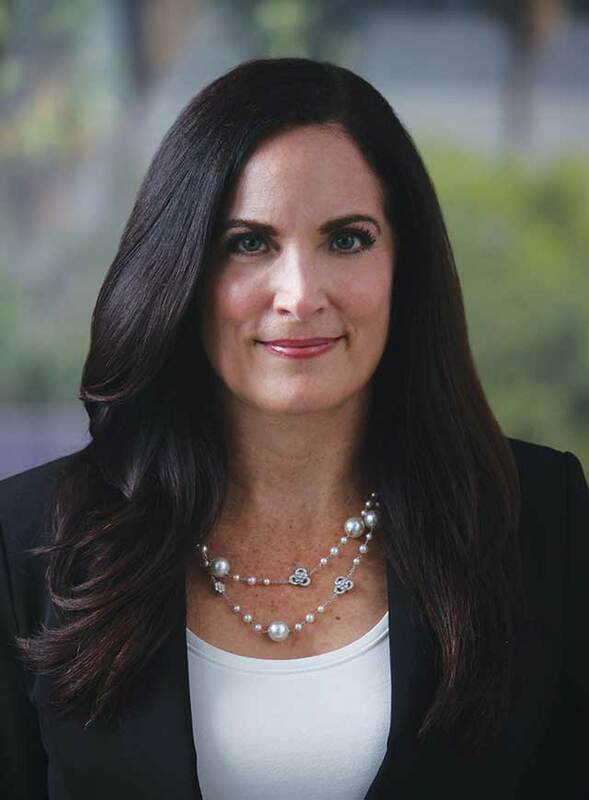 She is also one of only two women lawyers in the state of California named by the Daily Journal as one of the state’s Top Labor & Employment lawyers for eight years (2009-2013, 2016-2018). She has been recognized by Best Lawyers in America, as has her law firm, for her work in Plaintiff’s Employment Litigation. Genie gives of her time and expertise generously each year teaching litigation and trial skills to other lawyers through her volunteer work on boards and committees of various trial lawyer organizations, and through publishing articles locally and nationally. Currently the First Vice President of the Consumer Attorneys Association of Los Angeles’ (CAALA) Executive Committee. 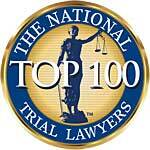 CAALA is the nation’s largest local association of plaintiffs’ trial attorneys. In 2021, Ms. Harrison will be President of CAALA – she will be the fifth female president of the organization in its 70thAnniversary year. She has served on the Board of Governors since 2008 and has co-chaired then chaired CAALA’s Education Committee and its Annual Las Vegas Convention for three years. From 2008 through 2017, Ms. Harrison has served as a member of the Los Angeles County Bar Labor & Employment Section Executive Committee (LACBA). Honorary member of the Board of Trial Lawyers Charities. 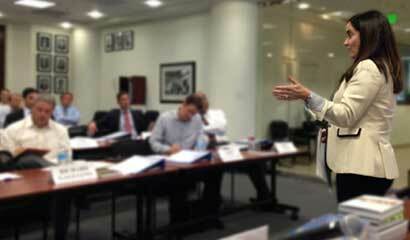 Genie Harrison is an outstanding advocate for plaintiffs in employment and civil rights cases. She does this work because she believes that you deserve justice. 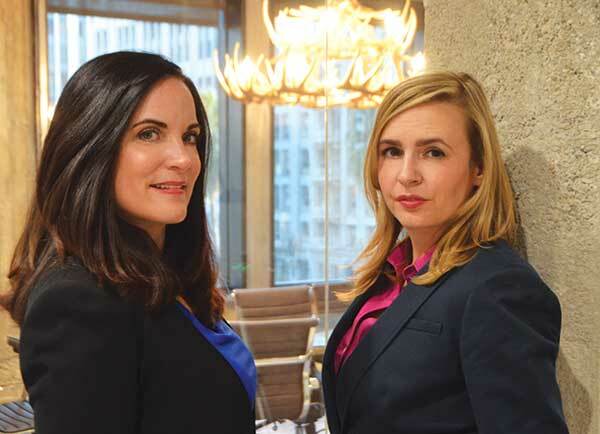 Attorneys Genie Harrison and Amber Phillips founded the Genie Harrison Law firm in 2013 to represent victims of wrongful termination, sexual harassment, discrimination, retaliation, and other employee rights violations. In 2018, Genie Harrison launched Legal Genie LLC, a technology company that creates and produces legal industry based apps to help people obtain maximum justice. 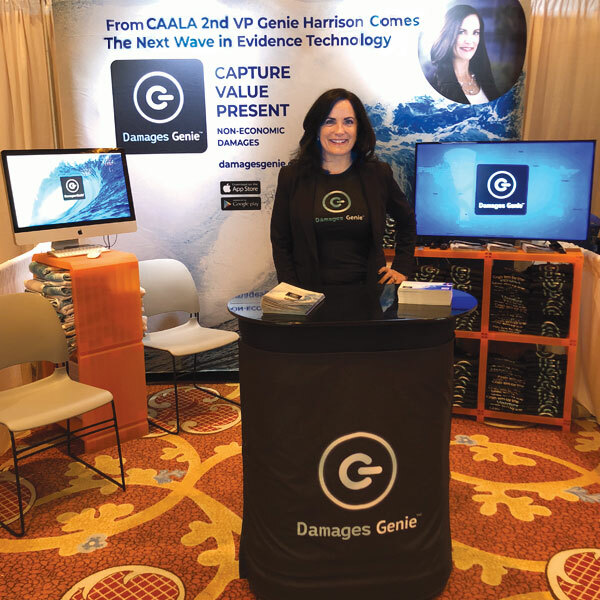 Genie also launched the first-ever app and software solution for plaintiffs to report and attorneys to analyze non-economic damages data, Damages Genie™. This innovative technology can help attorneys maximize non-economic damages for their clients, and facilitate attorney-client communication. Click on each association listed below for additional information. 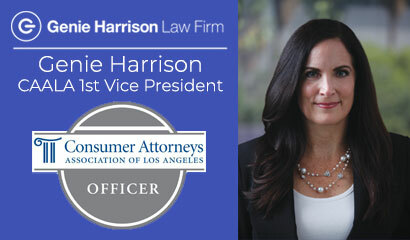 Genie Harrison is currently the First Vice President of the Consumer Attorneys Association of Los Angeles’ (CAALA) Executive Committee, the nations largest local association of plaintiff’s attorneys. In 2021, Ms. Harrison will be the fifth female president of CAALA in its 70th Anniversary year. 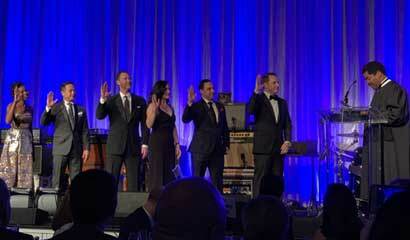 CAALA 2019 Executive Committee members Ibiere Seck, Minh Nguyen, Doug Silverstein, Genie Harrison, Jeff Rudman, and Sean McCann being sworn in by Judge Kevin C. Brazile at the Beverly Wilshire Hotel in Beverly Hills. Genie Harrison is an honorary board member of the Trial Lawyers’ Charities (TLC) of Los Angeles. CLICK HERE for more information on TLC and the charitable works they do in the community. Genie Harrison is listed on the 2019 Southern California Super Lawyers Top 10 attorneys list. Top 10 Southern California Super Lawyers (2016-2019). Top 100 Southern California Super Lawyers (2016-2019). Top 50 Women Southern California Super Lawyers (2010-2011, 2015-2019). Southern California Super Lawyers, Plaintiffs Employment Litigation (2009-2019). Daily Journal names Genie Harrison to List of Top 100 Lawyers in California, across all categories of law. 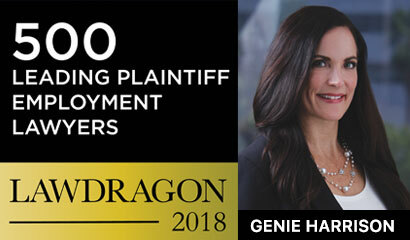 Lawdragon names Genie Harrison to nationwide list of 500 Leading Plaintiff Employment Lawyers. Genie Harrison has a 10.0 AVVO Rating. CLICK HERE > for Ms. Harrison’s profile page at www.avvo.com. Established in 1993, the Million Dollar Advocates Forum (which includes the Multi-Million Dollar Advocates Forum) is one of the most prestigious groups of trial lawyers in the United States. Fewer than 1% of U.S. lawyers are members. Tennie Pierce v. City of Los Angeles. The incident shook the foundations of the Los Angeles Fire Department. Tennie Pierce, a 19-year veteran of the LAFD, was the victim of racial harassment and retaliation, including being fed dog food mixed with his spaghetti. Tennie’s resulting lawsuit, along with several other high-profile cases, exposed the abusive and discriminatory atmosphere of the LAFD. As a result of these suits, an audit was performed by the city’s controller. It found that 87% of African Americans and 80% of women were aware of or had experienced some form of discrimination while at the department. As a result of the lawsuit and the high-profile focus upon racial discrimination in the Department, embattled LAFD Chief, William Bamattre, resigned. Douglas L. Barry was appointed as acting Chief, the first African-American in the Department’s history to assume the job. After much publicity, Tennie’s case was settled. In 2008, Genie Harrison was nominated for the CAALA Trial Lawyer of the Year Award. Ms. Harrison frequently offers her expertise to other attorneys and the media. Here is a partial list of articles by and about Genie Harrison. 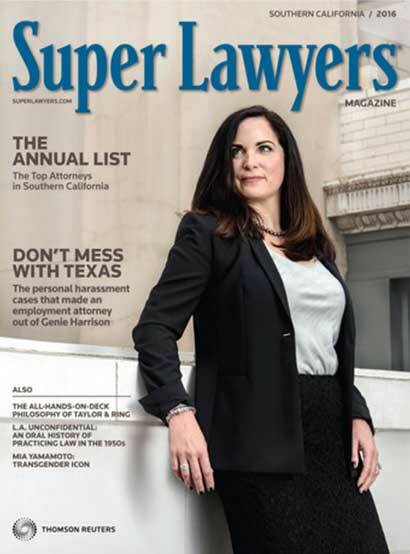 Super Lawyers Magazine featured a moving and inspiring story on Genie Harrison titled The Dignity Deposit: The Personal harassment cases that made an employment attorney our of Genie Harrison. 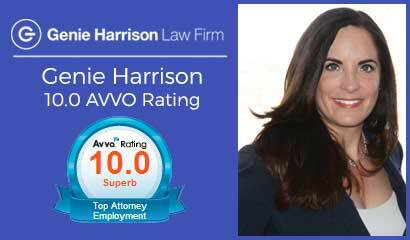 Ms. Harrison frequently teaches and lends her expertise to other attorneys at events and seminars throughout California. Here is a partial list of seminars and speaking events by Genie Harrison. 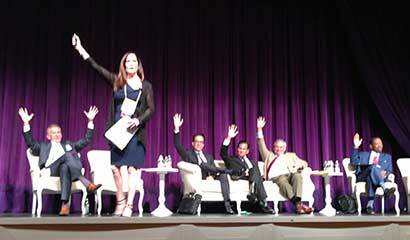 Genie Harrison speaking with the best lawyers in California on the Masters Panel at a CAALA Conference in Las Vegas. Genie Harrison was a speaker at the 2018 Annual Amber Rose Women’s Conference held at USC. 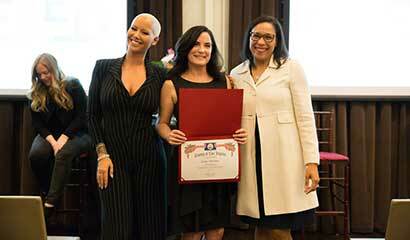 She was honored with a proclamation from the City of Los Angeles for her leadership in women’s rights advocacy. Genie Harrison was honored to speak at the 2017 Consumer Attorneys of California (CAOC) conference alongside Amy Fisch Solomon and Sonia Chopra on CAOC’s Annual Conference panel entitled “For Women Jedis: Women In The Courtroom.” Genie gave an inspiring and educational speech about her keys to winning at trial. 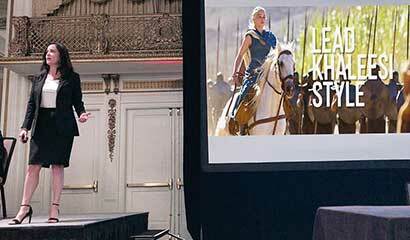 Her entertaining presentation incorporated storytelling elements from Game of Thrones — sorry for the spoilers — and inspired with a cool mashup of Daenerys Targaryen clips and her “Faith in Myself” speech. Click on the YouTube video above so you can be inspired, too. Los Angeles employment lawyer Genie Harrison teaching at the Consumer Attorneys Association of Los Angeles (CAALA) Plaintiff Trial Academy. Read about the mobile apps created by Genie Harrison to help victims.